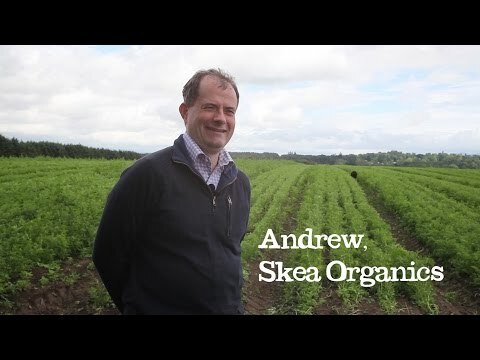 Andrew Skea – the man when it comes to spuds and carrots from the Monifieth hills north of Dundee. He has a truly encyclopaedic knowledge of the humble potato. Luckily, he’s all grown up now and can manage to collect quite a few more potatoes in a day’s work. His colourful, organic spuds, like Violette and Arran Victory, are seasonal stars which we look forward to each year. Arran Victory take their name from the island on the west coast of Scotland where they were bred in 1918 (you’re looking at 100 years of spud ancestry right here). They come equipped with a distinctive violet skin, slightly sweet flavour and a sallow, fluffy flesh which gives that soft edge after par-boiling. Funnily enough, that’s just what’s needed for the perfect ‘crisp on the outside, pillow-y soft on the inside’ roast spud. Why do we go all the way to Scotland for our spuds? Aphids, like southerners, don’t like the cold up there so they’re easier to grow without pesticides. Long live the highland tuber, we say.